Cemetery records have to be one of my favourite genealogical records. There are two kinds of records to look for – burial records and headstones and it is important to check for both. Headstones can give additional information that may not be found elsewhere. Sometimes there might be a year or exact date of birth, or the place where they were born, or there may other family members on the tombstone, nicknames or perhaps even a masonic symbol. With tomorrow ANZAC Day I must include Tasman Jarvis in this blog post. 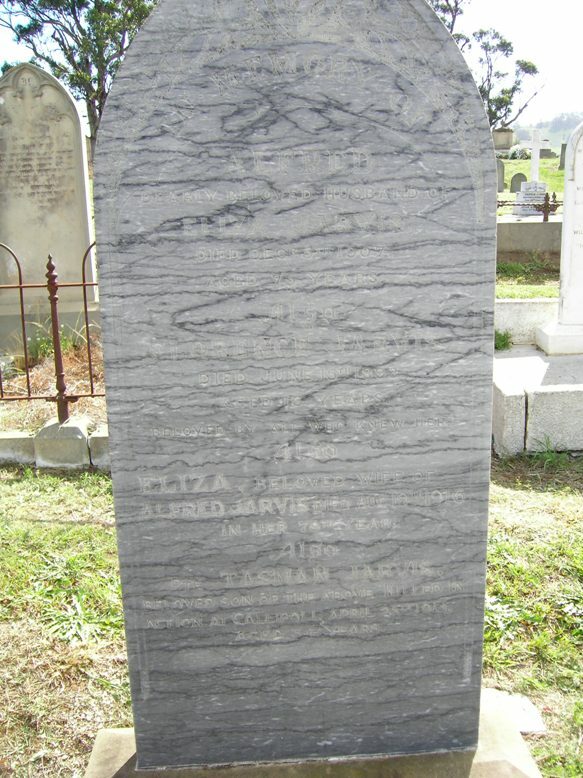 He died at Gallipoli on 25 April 1915 and his death is recorded on his parents’ (Alfred and Eliza Jarvis) headstone in Richmond cemetery, Tasmania. I first told his story in a blog post for ANZAC Day in 2010 – read about his story here. Next year will be the 100th anniversary of his death. My great grandmother Dorcas White died in Brisbane in 1935 and is buried in Toowong cemetery. It is a simple headstone with basic information but the real clue is ‘late of Charters Towers’. That kind of information can help to confirm it is the right person, especially when researching common surnames. Dorcas was buried with her son Herbert and the inscription for him has in brackets ‘Nibby’ which was his nickname, a fact I would not have known had it not been included on the headstone. Dorcas’ eldest son Sydney was buried in Charters Towers and the headstone records his accidental death aged 11 years. This clue led me to inquest records and I wrote about Sydney’s story in Week 4 Memorial Cards. Besides Sydney’s grave is Dorcas’ other son Robert who died aged 30 years. Again basic death information is captured but at the bottom is ‘erected by his loving wife and children’. A family missing their husband and father. While the White family did erect headstones for their loved ones, many of my other families did not. My Norwegian great great grandmother Aase Gunderson’s death was a mystery for many years. Her husband remarried but I could not find a death certificate and after the headstones of the major Brisbane cemeteries had been transcribed and indexed, I knew there was no headstone. My breakthrough came when the Brisbane City Council put the burial records online. Grave Location Search allowed me to find her husband’s burial under the name of Andrew (Andreas) Gunderson and the entry showed he was buried with four other people. I recognised three straight away as a son, a daughter and his second wife’s infant son. But there was also a Mary Gunderson in the grave and I could not place her in my family. After purchasing the death certificate I realised that I had finally found his first wife Aase’s death! At some point she had started calling herself Mary. Those with European ancestry will know that many people anglicised their names and while Andreas to Andrew was obvious, Aase to Mary was not and the parents names on the death index did not match what I believed her parents names were. This is why I had not previously bought the death certificate. Many Australian local councils have now placed their burial records online and it can be a great way of finding out when someone died and who they are buried with. Cross checking with BDM indexes online can also help to identify and sort family information. A Google search may give results for a cemetery otherwise do a Google search for the local council name and then look for their cemetery and burial information. There are two useful portal sites for Australian cemetery and burial information. Australian Cemeteries and Interment.net and both are subdivided by state and territory and then arranged in alphabetical order by cemetery name. Information provided usually includes online data, transcripts, photos, look ups, maps and further information. What is included varies depending on what information is available for the cemetery you are researching. Find A Grave is a US based website but there are Australian entries in the database and I was surprised to find that my great great great grandparents John and Helen Carnegie (nee Stratton) were listed. 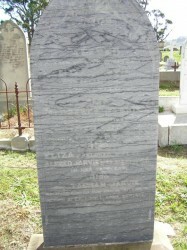 Their grave is the only headstone surviving in the historic Toorbul cemetery. The local council have now put up a memorial listing all those known to be buried there. 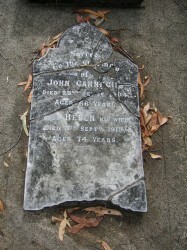 John and Helen’s grandson James Carnegie and his wife Mary (nee Finn) were buried in the Balmoral cemetery in Brisbane and this is also on Find A Grave. The contributor’s name is someone I have been in contact with over the years as one of his ancestors’ siblings married into the family. Had I not already been aware of his research, I could have contacted him to exchange more information. These are just some of the ways that cemetery records can assist with family history research. In our global world do not dismiss overseas websites as anyone can contribute to free data sites such as Find A Grave. If you add some of your own family information, you may make contact with someone else researching the same family. Also the major subscription databases also have burial and transcription information. I am sure everyone has their own success stories with burial records and headstone transcriptions but is it time to relook at your research and see what is new?